Lori Danelle: maker of things: Using my Christmas toys! However, I did find a somewhat quiet moment on a day when I, myself was not sick, to use a new gift I've been itching to try. I've been wanting a rotary cutter for about a year now, but every time I went to purchase one I became cheap and left without it. So, I asked for one for Christmas. Why, Oh why didn't I buy it sooner? 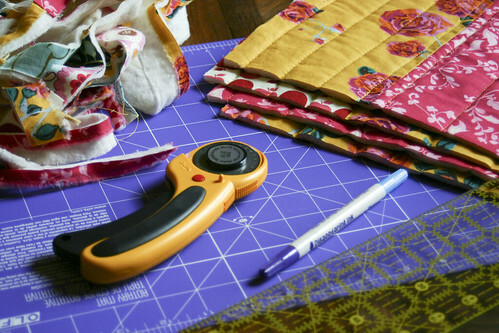 I finally got a chance to use it last week to trim out the quilt I'm making Little Sister. So easy—Like I knew it would be. Such straight, clean line—Like I knew it would be. And I was done in at least half the time it would have taken me to measure out & cut with scissors—Like I knew it would. . ..